Long ago, I stood at the window, my small fingers crossed. I prayed for snow to fall. A child who believed that with some divine intervention, she could will the fluffy flakes to float from the heavens above. My hand lifted the iron latch, pushed the window open a crack. I leaned into the space. Cold air kissed my cheek. Stillness lingered and paused within the eerie morning’s quiet breaths. Tall, gnarly branches of oak canopied the street. The oaks waited too. Waited for snow to dress them in winter finery. A voice broke through the silence. Time meant nothing to me then. Yet, this morning I had reason to dash. Mother was taking us to see the annual Christmas displays. I recalled the twinkling lights and little elves dressed in red and green that bustled about Santa’s miniature village. It was the reindeer I coveted. How do they fly? “It’s magic,” our mother said. Quickly my sister and I ran to the hall cupboard, opened it and grabbed our newly sewn velvet coats. “Where’s my fur hat?” I asked. Scrambling through the corners of the dark hall cupboard, I retrieved the faux fur hidden beneath my father’s plaid scarf. The hat was a gift; the muffler disappeared at school. “Found it!” I cried out. I watched my sister; her small fingers struggled to slip the shiny buttons through the stitched openings. Gently,I took her hand and showed her how. We slipped stocking feet into fur-lined rubber boots, momentarily teetering, off-balance from the weight of our outerwear. My sister and I stood in the doorway; two winter snow-babies waiting for snowflakes to tumble. Our mother, wrapped in Persian lamb, led the way as we headed toward the bus stop at the end of the block. As we waited for the 41st Street bus to appear, I looked up and peeked through the canopy of tangled branches that crisscrossed overhead. An empty nest sat tucked within a nook of hardwood. I wondered if Santa would leave a small gift for the birds to open when they returned in the spring. Perhaps a pine cone adorned with a strand of tinsel snagged from a glittering cast off Christmas tree. The bus rolled up to the curb, we clambered on board, dropped our coins into the cash slot and took our seats. “Hold on, Grace,” my mother tipped her head toward the shiny pole. As the bus lurched forward, my fingers held the metal pole, the other hand wrapped around my sister’s small one. We watched as passengers came and went about the business of life. Near the end of the line, a dapper man stepped aboard. He wore a top hat and wrinkled pin stripe suit. “Ladies,” he nodded and tipped his hat. In one hand, he held a scuffed leather briefcase; in the other he held a bouquet of bud roses, white as fallen snow. A second man stepped aboard; the white whiskers on his chin visible. His threadbare overcoat patched at the elbows. A red scarf scrunched about his neck. As he passed by I caught the acrid, heavy scent of cigarettes. Golden fingertips gripped the metal pole. When he smiled at us, there were dark spaces where teeth should have been. I looked away. “Merry Christmas,” he said and reached into his deep pocket, pulled out two wrapped candy canes, and grinned a toothless smile. My sister and I hesitated. 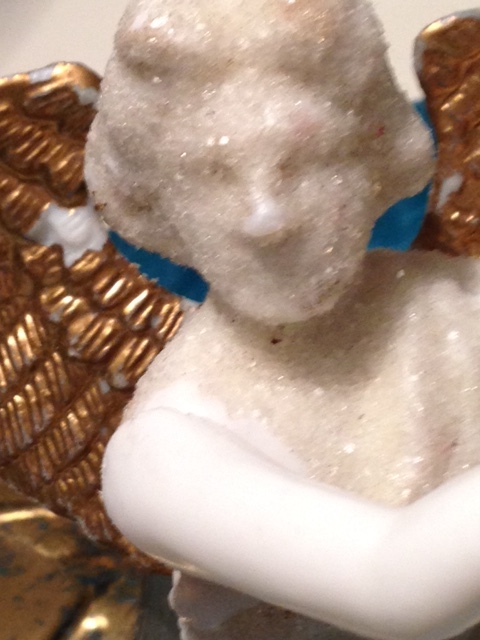 The man smiled and reached deep into the other pocket and pulled out a plastic angel. Golden wings glinted and gleamed. “This you must share,” he murmured. He reached out and handed the angel to me. “Say thank you, girls,” our mother said. I gingerly stepped from the bus, a candy cane clutched within one small fist; a sugared angel twinkled in the other. How would I manage to share such a treasure? Once again my mother took the lead and hustled us along to the Christmas displays. The miniature Winter Town hummed and bustled, alive with visions and sound. Holiday songs punctuated the scene. Candlelight shone through a small window as an elf stationed at a workbench hammered wheels onto a train. Another elf stood alongside and wrapped a gift. He placed it atop the growing pile of presents from Santa. Bells jingled and lights twinkled, snow blew from a machine and dusted our boots. It was the reindeer I had come to see. They lay upon hay; their thick whitish coats brushed and glossed, their velvet antlers strong and upright. At the peak of the stable hung an angel, a heavenly guardian hovered overhead. Who wouldn’t believe in wishes that come true, magic, heavenly beings and a hope for snow? Grace still doesn’t understand human nature; choosing to believe in goodness. She understands the science behind snow, the necessary ingredients of weather systems. Still, every December she pauses at the window, opens it just a crack. She leans in toward the opening and waits. For what you ask? For the cold wind to kiss her cheek, for those first flakes to fall, for that magical feeling of love to wrap itself around her, for an act of compassion or a kindness shared, for Santa to arrive, and for peace on earth. Believe.